For marketers, social media is a never ending learning game. One can never master social media because there’s always something to learn. When it comes to staying up to date with new trends, social media is an even tougher task. Social media is constantly changing, whether it is new algorithms or new features, not having an up-to-date strategy or up-to-date information, you might just end up being surpassed by your competitors. Or even worse, spend your time and effort on methods that do not longer work – or even harms your brand. If you compare it with SEO, it can end up like the keyword stuffing method after Google’s update Penguin. That’s why, in this article, I’ll provide you with 4 Things Every Marketer Must Know and Follow on Social Media. Hopefully, they’ll learn you some things you didn’t know, and help you optimize your strategy to come closer to social media success. It’s important that you are aware of the fact that not all social platforms are the same, and your social strategy should reflect that. Different platforms offer different ways to your customers’ hearts, and some social platforms don’t offer it at all. As a result, you need to be aware of the user demographics across the various platforms to see which platforms are for you. Choosing platform is just the beginning though. How you use them and how you make them fit into your marketing strategy are the real questions – and what really shows how well you are implementing the social media tools to your advantage. Something that is worth having in mind is that you should share different content on different platforms. That’s what they are made for! If all platforms would be created equal, what would be the point of having more than one? In fact, if you share the exact same content on all your platforms, what is the point for your audience of following you on more than one? For example, Twitter, with its 140 character short and snappy tweets, is a popular choice by brands for customer service. With Twitter, they can respond to their customers quick and easy with little effort. Facebook is a social networking site that is great for customer conversations, photo sharing, special offer promotions – and most important ads. Due to its very little organic reach, it is recommended to use paid advertising on the platform to get better results. Twitter is a so-called “micro-blogging” service that lets you send and receive short and snappy messages from and to your audience and potential customers. YouTube is an online video platform that lets you upload videos to the platform which your audience can watch. If you are a company who can present yourself with engaging videos, YouTube is great for customer engagements. blogs are internet sites on which you can share almost anything and everything – from videos to articles to photos. If you already have a website, adding a blog page on it can be a great way to attract new audiences and increase your retention rate. When choosing, you simply have to ask yourself: ” what type of company am I?”. Are you more into the written word to promote your business or are you more into visual content and video creating? Having that and the audience demographics of the different platforms in mind should help you pick the most suitable platforms for you. How often are you posting on your social platforms? Even better, how often are you visiting the platforms, responding to your customers’ questions, thanking them for their support, and engage with them? If your answer isn’t every day, you’re doing it wrong. While all social platforms have different “optimal numbers” of posts, none of them is less than one post a day. And there’s a good reason for that. However, some of you might be surprised to hear that posts are not everything. The reason to why you should post at least daily is so that you have a constant presence close to your audience, and as a result make sure that you are never forgotten and always on top of their minds. While posts are good, they aren’t really personal, in fact, they are actually very broad, and they will most likely not make your followers feel special and unique. You probably already know where I’m going with this, but what do you think ticks the boxes of successfully achieving the things mentioned above? Engaging with your audience on a personal level – one on one is far more valuable than putting out content. While posting content still is super important, it should not be done at the cost of ignoring to engage. By engaging with your audience, such as having conversations regularly with them, asking them questions, giving them your opinions, thanking them for their support in your brand, rewarding them etc., you’re building up a trust to you and your brand. As you might know, trust is the single most important thing that drives sales. What’s more is that if you want to engage with your audience and have good results, you need to do it on a regular basis, because trust isn’t built over night. Your language is super important on social media because it will have a huge effect on how people see your brand. The language you use, not only on social media but all the places where you engage with your audience should be very well thought of, and it should also be specifically written in your strategy so you won’t forget your core values. The language you use should clearly reflect the audience you are trying to target. As you can imagine, by speaking the same language as the people you are trying to reach, you are decreasing the gap between brand and customer, and present yourself as one of them. Hopefully, they’ll also accept you as one of them. Do not try to be something you aren’t just to get your audience to like you because people will see through your act and your efforts will backlash and ultimately end up harming your brand. 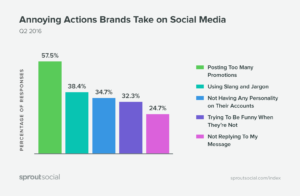 In fact, 38,4% of social media users said that brands using slang or jargon were the most annoying thing on social media. As a result, 71,3% of users have ended up unfollowing the brand due to the embarrassing behavior. Unless you’ve successfully built up a culture that your audience is in on, stick to keeping your language neutral and avoid slangs and jargon. Especially slangs you don’t even know the meaning of. Froosh smoothies sometimes use slang in their social media posts, but since they’ve built a culture around fruit and clean eating, their audience can relate to it! Also, their target audience is quite young. Live streaming is something that has gotten immensely popular in just the last couple of years, and most major social platforms have incorporated the feature into their platform. or on the fact that people spend 3x more time watching Facebook live videos compared to videos that aren’t live. It’s a sign of an increased popularity and demand of live videos from the audiences, and missing out on it would be a foolish move. Live video is a great way to get closer to your audience and build a genuine relationship with them. For many brands, letting their audience in behind all of their fancy banners and logos is something unfamiliar and scary, but live video helps you do it in a seamless way. 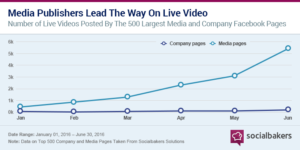 There are literally hundreds of ways you can incorporate live video into your social strategy, but these four ways will help you get started. Most brands only show their audience the end product that is shaped to perfection, but what they don’t realize is that their audience thinks it’s much more interesting to see how the product they are holding in their hand, or the service they use was made and became a reality. There really aren’t any limitations here. The more genuine your behind-the-scenes videos are, the more engaged and passionate about your brand will your audience become. You can show everything from sourcing the leather to your wallets, or how you embroid our t-shirts. Really anything that your audience doesn’t see every day from you. Q&A, also known as questions and answers is something that has become increasingly popular on live stream. Running a Q&A means letting your audience ask a bunch of questions and you answer them. You’d be surprised to hear that your audience have more questions than you might think, and responding to them directly is a way to provide excellent customer service with a touch of personality since it is a real human who shows their face and expression when answering, instead of just sending an email. Also, running Q&A:s lets you remove a load from your customer service channels since many of the questions that might otherwise have been sent through email got responded directly with an answer that they are satisfied with. Showing how and where you and your team work is a great way to build a closer relationship with your audience. By showing how and where you work, they will think of that every time they engage with your brand. All of a sudden, the distance between you and your audience won’t feel that far as a result. Doing this has the best effect on your audience. People like to engage with people, and they like to know who they are engaging with. Take your time to present every single individual in your team, what they do, and how people can get in contact with them. 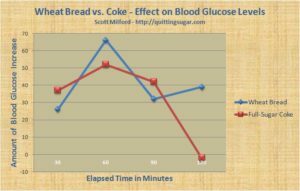 By doing all of the steps above, you can be sure to get an audience that is a lot more engaged and interested in your brand, and their trust in your brand will increase like the blood sugar level after drinking a Coca-Cola or eating white bread. Marketers have a lot to think about when it comes to social media. There’s no denying that. However, by staying on top of the latest trends, changes in the market, and updates, you can simplify your work and be ready to move agiler. Make sure you are aware of the differences between the social platforms that are at your disposal, study their user demographics and features to see whether or not they have a spot in your marketing strategy. If they do, use them! If they don’t, avoid them – for now, but never fully ignore them because they might just return stronger than ever when you least suspect it, and then you want to be prepared for it and take advantage of the newly found power it has gotten.